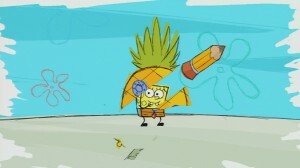 Spongebob Squigglepants for uDraw on Wii is out | DaDa Rocks! 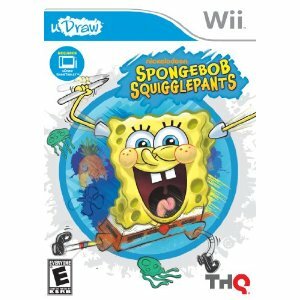 Another great game for kids and fans of Spongebob came out today, its Spongebob Squigglepants [amazon] for uDraw [amazon] on the Nintendo Wii. A fast-paced, fun-packed video game for the popular uDraw GameTablet for Wii. In SpongeBob SquigglePants, players will need to tilt, flip, shake, roll, flick, sketch, tap, trace and draw their way through more than 100 “nanogames” lasting merely a few seconds each. As their experience progresses, each nanogame will become faster and faster. Throughout each nanogame, players will get a look at never-before-seen SpongeBob art styles from the Nickelodeon vault, such as “Pixel Bob,” inspired by the 8-bit world of video games; “Punk Rock Bob,” “Comic Book Bob” and many more! The SpongeBob SquigglePants game is hosted by the live-action character Patchy the Pirate, who guides players through the game and also makes surprise appearances and interactions with them as they go through the nanogames. The game is perfect for advanced 3 year olds, my 2 year old was able to play a few of the nanogames after watching me give it a go once or twice. The game is sweet for 4 and 5 year olds who have mastered the uDraw and Wii game play. I really love how sort some of these games are which totally keeps the attention of the kids. In SpongeBob SquigglePants, players might have to flick the uDraw stylus to toss a flying disc to Larry the Lobster in “Flying Disc of the Deep”; tilt the GameTablet to help SpongeBob blow out all the birthday cake candles in “That Takes the Spongecake”; or draw a quick line between two cliffs to create a bridge for Plankton to cross and grab his coveted Krabby Patty in “A Bridge Abridged.” These are just some of the scores of quirky tasks players will experience. SpongeBob SquigglePants also treats fans to never-before-seen art styles from the Nickelodeon vault, including “B-Movie,” inspired by the thrilling days of drive-in movies and stylish horror films; “Sketch Bob,” which gives the seaworthy inhabitants of Bikini Bottom a freehand style look; “Simply Bob,” a stylized and abstract interpretation of life under the sea; and many others. What’s more, SpongeBob SquigglePants features Patchy the Pirate, the president of the SpongeBob fan club, as its live-action host. Patchy not only guides players through the game, but also makes surprise appearances and interacts with players as they tackle the huge array of Nanogames, offering an added level of spongy fun. Adding to the fun, SpongeBob SquigglePants lets players digitally draw, paint and color with a free-form drawing function, or choose from dozens of SpongeBob-themed stamps. With the uDraw, they create a masterpiece worthy of a place in Patchy’s own collection of SpongeBob art – or their own refrigerator, thanks to the uDraw’s exclusive ability to export art to the Wii system’s SD card slot. The SD card capability also makes it possible to share artwork with friends via e-mail or save it to computer desktops. SpongeBob SquigglePants is rated E for everyone and is available exclusively on uDraw GameTablet for Wii, with a suggested price of $29.99. For me this game is really cool and for any spongebob fan – its a must buy! For those looking for a great kids game its awesome but please note you need the uDraw before you can squiggle out with this game. NextHow have computers improved your child’s life?